If you choose our home made OS (based on CenOS), your servers are delivred ready to use with the latest stable softwares. you can install on them a working website in less the a minute. All you need is already installed (http, DNS, mail server, mysql, php, perl, user interface, firewall and much more). Espace 2001 make it easy for you to control and use your server through our control panels. 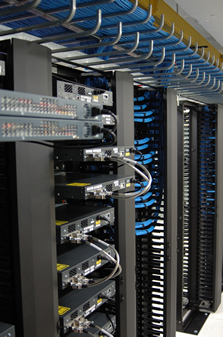 Present in many datacenters and countries, Espace 2001 is able to host your server at the right place. All our servers are under monitoring 24/24 7/7 and we intervene as needed. We also assure all the upadates on you server. Our support is competent and free. A trusted SSL certificate is included with your server. You have an SLA warranty of 99.95% uptime. You can also have a server with the OS of your choice. No long term contract, you can stop the use of your server when you will. Your server comes ready to work. Espace 2001 provides free telephone support. Your server has a remote reboot without charge. For the security of your server, we installed the following softwares: PortSentry, Snort, Ossec , SpamAssassin , RkHunter, firewall..
With your control panel you install a website in seconds. Espace 2001 has long expérience in hosting (since 1997). You don't need to be an expert in Operating systems, we are there for. Free telephone support and management of your server are inckuded in our offers. Tools for for automatted backups are on your server. Bandwidth is included in our prices. You dispose for your server from the latest operating systems. Our servers are available, no waiting time.